A few weeks ago, someone mentioned to me that when you send a packet over the internet, it travels at a significant fraction (~80%) of the speed of light, just based on the time it takes to get a response and the physical distance travelled. This was surprising to me, but it was believable enough for me to spend some time investigating it. PING wesleyac.com (192.64.119.124) 56(84) bytes of data. This server is located in LA, and I'm in NYC, putting the distance at 3965 km (7930 km for a round trip). That gives us a speed of just over 99000 km/second. We can find the speed of light in fiber optic cable1 by dividing the speed of light in a vacuum (299,792,458 m/s) by the refractive index of fiber optic cable (usually ~1.468)2, getting ~204,218,296 m/s. Thus when I ping my server, I'd estimate that on average the packet is travelling at around 48% of the speed of light in fiber optic cable. This is quite impressive (It's about 22 million times faster than the Pony Express, for example3), but it's not the ~80% figure that I'd heard, so I decided to investigate further. Doing this, I can see that while the majority of the hops are fairly short, most of the time is taken up between hops 5 and 6, which are when it actually goes from the east coast to the west coast. For a while, I toyed with the idea of geolocating each hop, and finding the total distance travelled that way. However, there's a much easier way to find the latency between two hops - AT&T has a webpage that shows the latency between almost any of it's nodes. 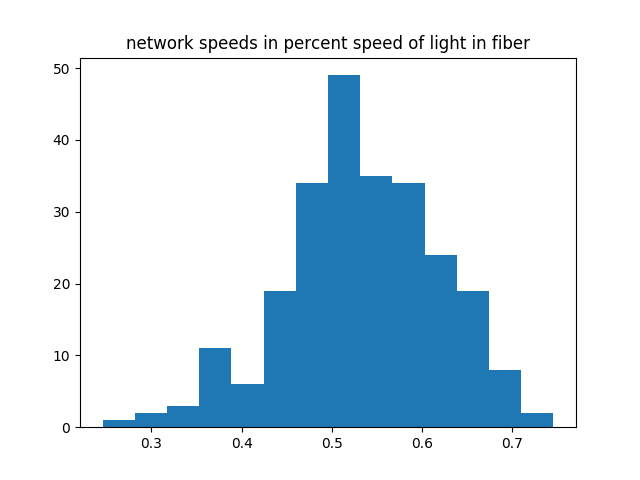 The LA to NY latency as of this writing is 63 ms, which works out to ~62% of the speed of light in fiber. Interestingly, the fastest one of these is Denver to Chicago, which goes at 154.5 km/ms, or ~76% the speed of light in fiber! This is approximately the same speed as SF to Hong Kong, which is quite surprising - I would expect SF to Hong Kong to be much faster than Denver to Chicago, since a larger percentage of the time would be spent travelling over fiber. I now have a much better intuition for how fast packets travel, and I hope that this was enlightening for others as well! Thanks to Christian Ternus, Dan Luu, and Laura Lindzey for comments/feedback/discussion.